Whether it’s been the time of the top hat or the day of the derby or the generation of the backwards baseball cap, it seems like Wing Tips have always been worn by important men … and men who want to look important. It’s the classic American mustache. Start by growing your mustache for a good three weeks or until you’ve achieved a half-inch or more of consistent growth. Use your Wahl® trimmer to lightly trim around the mustache, making sure to leave the tips, or edges, about a quarter-inch longer. Using the trimmer, shape the underside of the mustache into two equal “U” shapes. Make sure both U shapes meet in the middle—at the top of their arcs. Use the crease of your top lip as your guide. Remove excess hair below the point where the two U-shape patterns meet to create the wavy appearance this look is known for. Finish it off with some mustache wax on the tips—use your fingers to pinch the tips to create defined points on both sides and then style them on an upward, 45-degree angle. 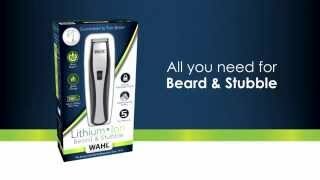 Maintain the look by using your Wahl® trimmer with the appropriate guard to keep the mustache at the desired length. Use the trimmer to crop around the mustache in the same way as before.